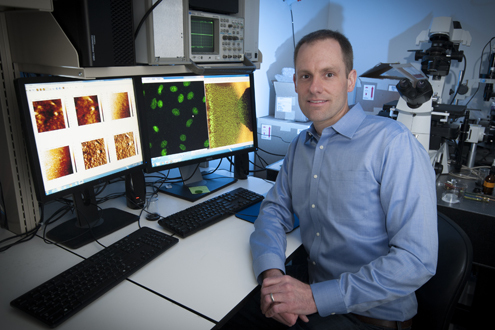 Corey Neu, associate professor of biomedical engineering, has won a Faculty Early Career (CAREER) Development award from the National Science Foundation (NSF), one of the most prestigious NSF honors for outstanding young researchers. The NSF issues about 400 CAREER awards annually to support early career-development activities of teacher-scholars who most effectively integrate research and education within the context of the mission of their organization. The CAREER award will support Neu’s project entitled, “Direct Measurement of Intranuclear Strain and Gene Expression in Single Cells in Vivo,” which is a study of the mechanics of the cell nucleus in model systems like tissue explants and mice. The research objective of this project is to apply advanced microscopy, image registration, and molecular biology methods to study the biomechanics of the cell nucleus and basic mechanisms that determine the physical regulation of gene expression. The nucleus is a central membrane-bound organelle in the cell that functions to control fundamental cellular activities that are critical to normal physiology. Studies conducted under this award will image the nucleus of single cells embedded in native tissue that is perturbed by mechanical force, and determine the influence of cytoskeleton proteins on intranuclear shape, deformation, and activity. A multiscale and translational approach will also study the nucleus in normal and genetically modified mice to investigate how mechanical force regulates gene expression in vivo. If successful, these studies would significantly advance the understanding of the physical regulation of the nucleus in structurally complex and hierarchical biological tissues. The knowledge gained from the research activities will reveal how subcellular strain is altered in disease and injury, and studies will establish new analysis tools for the noninvasive, in vivo, and functional biomechanical assessment of nuclei in model systems. More broadly, the research activities may impact tissue engineering, regenerative medicine, and related fields, by establishing the ability to study mechanisms of nuclear strain and gene expression in single cells, including studies of rare cell populations within tissues and biomaterials. In addition, Neu was recently awarded a Research Project Grant (R01) of approximately $1.6 million from the National Institutes of Health (NIH) for his work in the early detection of osteoarthritis (OA). The R01 supports a five-year study entitled “Probing Osteoarthritis Pathogenesis by Noninvasive Imaging of Cartilage Strain.” Neu will utilize a powerful new MRI machine recently installed at the Bindley Bioscience Center in Purdue's Discovery Park to conduct this study.